In 1985 I visited Israel and everywhere I looked I could see army personnel. They would walk around in a group of 3, with bullet proof vests and sub machine guns at the ready. This was an expected sight as the country is always in a state of war, whether actively or just waiting for one to happen. In 1991 I saw the same level of army presence in Singapore and as I was travelling alone, I found this of great comfort. In Switzerland, Italy and France you see the army patrolling the streets and frankly, I do not even blink an eyelid when I see this. There is a feeling of safety and security and the police carry some weight, making crime seem impossible. In South Africa, crime is everywhere. It is creeping closer and closer to where I live, with our local shopping mall having been the most recent target of a cash in transit heist. I think it is about time we deploy the army to patrol our streets and shopping centres. They should be armed and ready to shoot and anyone who pulls out a gun should expect to be killed. It is about time that the people in charge of this country took control so that we can feel safe and secure in what to me is still the most beautiful place on earth. Something else I ‘witnessed’ for the first time in Israel, was the use of the spice blend Za’Atar. I am sure every household has its own recipe, and I used mine to coat some labneh. 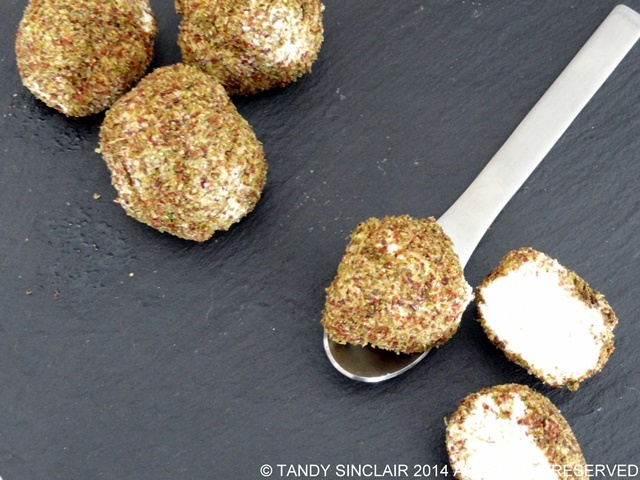 These middle eastern treats are easy to make at home, and no matter where you live, you will be able to experience the beautiful creamy fresh cheese with this spice blend. I used the left over Za’Atar to season a chicken I was roasting for a family dinner. Does the army patrol the area where you live? Za'Atar is a herb blend made mainly from fresh oregano and is used in middle eastern cooking. I’m sorry that your area has been experiencing so much crime. Where I live in New Hampshire, most people don’t even lock their doors on their homes or cars. It is definitely a different world. Oh, I do love za’atar. This post makes me realise how lucky we are here in NZ. I hope it stays that way Rachel! There is no army patrol in Boston and while I almost always feel safe, there are definitely times (mostly at night in certain areas) that I don’t. Luckily, we have a pretty strong police force. Za’Atar sounds like the kind of spice I’d want to put on everything!! As soon as we can get rid of our corrupt government we are half way to resolving a lot of issues Tandy. The past week of our implementing patrols and neighbourhood watch What’s App groups we have managed to catch two criminals. It is working so well. Our community has taken control. If you have the support of your community you can overcome all the crime, one day at a time. Let me know if you would like to implement anything in your area and I can send you everything I have put together so far.